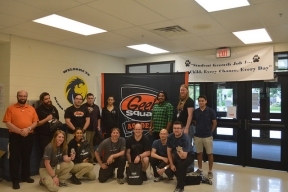 Approximately 125 local youth gathered for hands-on technology training at Round Lake Area Schools as part Best Buy’s Geek Squad Academy program. The free two-day camp in Chicago aimed to inspire kids to consider careers in technology – with opportunities to learn digital filmmaking, 3D design, robotics and more through interactive sessions. Technology education is increasingly crucial as up to 77 percent of jobs will require tech skills in the next decade. The Chicago session is one of over 30 camps this summer offered by Best Buy’s Geek Squad Academy program, which partners with local nonprofits and other organizations around the country to provide much-needed technology education for under-served kids aged 10-18. To learn more, visit: http://www.bby.com/community-relations/. Approximately 125 local youth united in technology education at Round Lake Area Schools as part of Best Buy’s Geek Squad Academy program. The free two-day camp inspires under-served kids to consider careers in technology – with opportunities to learn about digital filmmaking, 3D design, robotics and more. To learn more visit: http://www.bby.com/community-relations/.